Burkitt’s lymphoma (BL) is typified by frequent tumor cell apoptosis and significant macrophage infiltration. Since BL cells have an inherent tendency to undergo apoptosis at a high rate, we reasoned that macrophages in BL are functionally enhanced in at least two activities that have implications for tumor pathogenesis: 1) engulfment of apoptotic cells, an anti-inflammatory process known to suppress immune responses, and 2) production of BL cell survival factors that limit the extent of tumor cell apoptosis. In this study, we show that the microenvironment of BL is rich in the pleiotropic cytokine IL-10, which can be produced by both tumor cells and macrophages, and that IL-10-activated human macrophages have enhanced capacity to engulf apoptotic cells in vitro. This was found to be dependent on the macrophage tethering receptor of apoptotic cells, CD14. Furthermore, IL-10-activated macrophages were found to produce markedly higher levels of the B cell survival factor, B cell-activating factor of the TNF family/B lymphocyte stimulator (BAFF/BLyS) than macrophages matured in the absence of IL-10. Coculture of macrophages with BL cells further enhanced BAFF secretion. Significantly, we show that enhancement of BL cell survival by IL-10-activated macrophages is mediated by a BAFF-dependent component and that BAFF is produced at high levels by tumor-associated macrophages in situ. These results indicate that macrophages, regulated by IL-10, have the potential to promote BL pathogenesis, first, through suppression of antitumor immunity following enhanced engulfment of apoptotic tumor cells and, second, through increased production of tumor cell growth/survival factors. The characteristic “starry sky” histological picture of Burkitt’s lymphoma (BL)3 is generated by macrophages that infiltrate the tumor in abundance (1). Little is known of the functional activities of these tumor-associated macrophages (TAMs) or their contribution to BL pathogenesis. Apoptotic bodies are frequently encountered in histological sections of BL bearing testament to the constitutive high-rate apoptosis of these tumor cells (2) driven, just as their uncontrolled proliferation, through deregulation of c-myc (3). The vast majority of the remnants of apoptotic cells appear in situ in BL not as free entities but as cytoplasmic components of TAMs, indicating that one of the functions of the macrophages in BL is the phagocytosis of apoptotic tumor cells. The clearance of apoptotic cells by macrophages involves a complex array of receptors, soluble factors, and apoptotic cell-associated ligands (see Refs.4, 5, 6 for recent reviews) but the roles of these molecules in TAM-mediated BL cell clearance remain unknown. Importantly, the phagocytic clearance of apoptotic cells, far from representing simple waste disposal, has key consequences for the regulation of immune responses (5) and, as such, the clearance of apoptotic BL cells by macrophages in situ is likely to have implications for anti-BL immunity. Thus, since the mechanisms underlying apoptotic cell clearance activate anti-inflammatory, immunosuppressive, and repair processes in macrophages, it is predicted that one outcome of engulfment of apoptotic BL cells by macrophages would be suppression of antitumor immunity. Mounting evidence from studies of nonlymphoid neoplasms indicates that TAMs play important roles in supporting malignant outgrowth by producing factors that promote angiogenesis, tumor cell survival, and proliferation as well as suppressing innate and adaptive antitumor immune responses (7, 8, 9, 10, 11). The inherent propensity of BL cells to undergo “spontaneous” apoptosis, probably as a consequence of limited availability of microenvironmental survival factors leading to c-myc-driven apoptosis rather than proliferation (3, 12), led us to hypothesize that an important function of TAMs in BL is the limitation of apoptosis through local provision of survival factors. We have shown previously that macrophages can support BL population growth in vitro (13) through mechanisms that remain largely undefined. Given the potency of the myeloid cell-derived B cell-activating factor of the TNF family (BAFF, also known as BLyS (B lymphocyte stimulator)) in promoting growth and survival of malignant, as well as normal, B cells (14, 15, 16, 17, 18), it is conceivable that such factors, derived from TAMs, could be locally active in suppressing BL cell apoptosis in situ. In this study, we propose that TAMs in BL are activated to perform two critical functions that could aid tumor pathogenesis: 1) engulfment of apoptotic tumor cells with high efficiency, expected to maximize suppression of antitumor immune potential since efficient apoptotic cell clearance by macrophages is important both in suppressing inflammatory responses at sites of apoptosis and in maintaining adaptive immune tolerance (5), and 2) production of BAFF leading to the limitation of tumor cell apoptosis required for net tumor growth. Using a combination of in situ and in vitro approaches, we demonstrate that the microenvironment of BL is rich in the pleiotropic cytokine IL-10 and that IL-10-activated macrophages are markedly enhanced in their capacity to engulf apoptotic cells. We further show that BAFF is produced at high levels both by TAMs in BL and by IL-10-activated macrophages and demonstrate that promotion of BL cell survival by macrophages in vitro is BAFF dependent. These findings describe for the first time two enhanced functional attributes of macrophages in BL that have the potential to influence tumor pathogenesis: enhanced apoptotic cell clearance and BAFF production. Five-micrometer sections of Formalin-fixed, paraffin-embedded SCID BL or human BL tissue from five different cases were stained for IL-10 using goat anti-human IL-10 (with cross-reactivity to murine IL-10; R&D Systems). Staining was detected with a biotinylated rabbit anti-goat IgG Ab from Vector Laboratories. The presence of BAFF in Formalin-fixed, paraffin-embedded BL tissue was detected with biotinylated goat anti-human BAFF (BAF124; R&D Systems) or a rat anti-mouse BAFF (Alexis Biochemicals). For IL-10 and BAFF, sections were first heated in Antigen Retrieval Solution (Vector Laboratories) for 15 min at 1000 W in a microwave oven. Endogenous peroxidase was blocked using 2% (v/v) hydrogen peroxide. Nonspecific adsorption of Abs was blocked using serum-free Protein Block (DakoCytomation) and Abs were diluted in ChemMate Ab Diluent (DakoCytomation). Reactions were amplified using Vectastain Elite ABC avidin-biotinylated peroxidase complexes and enzyme substrate was 3,3′-diaminobenzidine (Vector Laboratories). Hematoxylin or methyl green was used as counterstain. Peripheral blood monocytes and neutrophils (PMNs) were isolated from citrated blood from normal volunteers by dextran sedimentation and centrifugation on Percoll as described elsewhere (19). Monocytes were cultured for up to 5 days in the presence or absence of IL-10 (5 ng/ml), TGF-β1 (10 ng/ml), IL-4 (20 ng/ml), or GM-CSF (10 ng/ml; all from R&D Systems) in X-Vivo medium (BioWhittaker) containing 10% autologous serum in multiwell plates as described previously (20). The group I (biopsy-like) EBV-positive BL lines Mutu I (21), “Tumor Mutus” (see below), Wan and Chep (22) as well as Raji (23) (EBV positive), BL-2 (24), and Ramos (both EBV negative) were cultured in BL culture medium (RPMI 1640 medium containing 2 mM/L l-glutamine supplemented with 10% Serum Supreme (BioWhittaker) and 100 IU/ml penicillin and 100 μg/ml streptomycin (Invitrogen Life Technologies)). Six- to 10-wk-old BALB/c SCID mice were injected i.p. with 10 × 106 Mutu I human BL cells in 100 μl of BL culture medium. Tumors usually developed i.p. within 2 mo of injection (C. A. Ogden, I. Johannessen, and C. D. Gregory, manuscript in preparation). Mice were then humanely sacrificed and tumors were excised. Tumors were either fixed in normal-buffered Formalin and then mounted onto slides for immunohistochemistry or were disaggregated to isolate BL cells (Tumor Mutus). Briefly, tumors were manually disaggregated with forceps and scapel, then incubated in the presence of 2 μg Liberase and 1 μg DNase (both from Roche) in 5 ml of RPMI 1640 medium for 20 min in a 37°C water bath. Cells were then washed and plated onto 10-cm2 tissue culture plates (Corning) and incubated overnight at 37°C in 5% CO2. Nonadherent cells were harvested and lysed for RNA collection. Five-day human monocyte-derived macrophages (HMDMs) were washed twice with HBSS (Sigma-Aldrich), incubated on ice for 15 min in the presence of cold HBSS plus 10 mM EDTA (Sigma-Aldrich), and gently lifted into suspension using cell lifters (Sigma-Aldrich). Macrophages (1 × 106) were washed twice in PBS containing 0.25% BSA (PBS/BSA) and incubated with anti-CD14 mAb 63D3 (1/50 dilution of ascites) in PBS/BSA for 1 h on ice. After washing, cells were incubated with goat anti-mouse IgG-PE (F(ab′)2, 1/50 dilution; DakoCytomation) in PBS/BSA for 30 min on ice in the dark. Immunostaining of TLR4 was conducted using goat anti-human TLR4 (1/50; Biocarta) visualized with anti-goat Ig-FITC (DakoCytomation). Washed cells were analyzed on the Coulter XL flow cytometer (Beckman Coulter). IL-10 was assayed in supernatants of BL cells in logarithmic growth using the IL-10 DuoSet ELISA kit (R&D Systems) as per the manufacturer’s instructions. TNF-α was assayed in supernatants of 5-day macrophages cultured in the presence or absence of LPS (5 ng/ml, Salmonella Minnesota strain 595; Calbiochem) for18 h using the TNF-α DuoSet ELISA kit (R&D Systems). BAFF was assayed in the supernatants of macrophages that had been cocultured with Mutu cells for 18 h. Briefly, Mutus were washed and resuspended to 0.5 × 106 cells/ml in serum-free RPMI 1640 and cocultured with untreated or IL-10-matured macrophages for 18 h before supernatants were harvested. To investigate the role of IL-10 in macrophage BAFF production, macrophages were incubated in the presence or absence of 1 μg/ml neutralizing chicken anti-human IL-10 Ab or 1 μg/ml chicken IgY isotype control (R&D Systems). BAFF was detected using a monoclonal anti-human BAFF capture Ab (mAb1241) and a biotinylated goat anti-human BAFF detection Ab (both from R&D Systems), with recombinant human BAFF used as standard (Chemicon). Plates were developed using SigmaFast o-phenylenediamine peroxidase substrate (Sigma-Aldrich) and read on a plate reader at 492 nm. Mutu I BL cells were cultured for 18 h following UVB irradiation (100 mJ/cm2). PMNs in RPMI 1640 medium plus 0.25% BSA were incubated at 37°C for 24 h to encourage spontaneous apoptosis, washed in HBSS, and resuspended in RPMI 1640 medium (Invitrogen Life Technologies). Apoptosis was assessed routinely by fluorescence microscopy of 4′,6′-diamidino-2-phenylindole (DAPI; Sigma-Aldrich) (25) or by morphological assessment of H&E-stained cells following cytocentrifugation. Five-day HMDMs were washed in HBSS, and apoptotic cells in RPMI 1640 medium added at a 5:1 ratio of apoptotic cells:macrophages as described previously (20). Cells were coincubated for 1 h and then excess apoptotic cells were washed off with PBS. Cells were fixed in 1% formaldehyde, stained with hematoxylin, and phagocytosis was analyzed microscopically using an inverted microscope (20). Phagocytic index was calculated as the percentage of phagocytosing macrophages × the average number of apoptotic cells engulfed per macrophage (26). As indicated, macrophages were pretreated for 30 min with anti-CD14 mAb 61D3 or 63D3 and washed before addition of apoptotic cells. For assessment of clearance of opsonized cells, PMNs were incubated at 37°C with mouse anti-MHC class I mAb (1/20; BD Pharmingen) followed by rabbit anti-mouse IgG (1/20; Sigma-Aldrich) with intermittent agitation. Cells were subsequently added directly to macrophages and phagocytosis was assessed as described elsewhere (27). Mutu cells were resuspended in serum-free RPMI 1640 medium to 1 × 105 cells/ml into wells of a 24-well plate. Recombinant human BAFF (20 ng/ml; Chemicon), recombinant human CD40L (1 μg/ml; PeproTech), or recombinant human IL-10 (5 ng/ml; R&D Systems) were added and the cells were incubated for 24 h at 37°C. For coculture viability assays, Mutus were prepared as above and then added to washed human monocyte-derived macrophages in serum-free RPMI 1640 medium in the presence or absence of goat anti-human BAFF-R (10 μg/ml; R&D Systems), neutralizing chicken anti-human IL-10 (1 μg/ml; R&D Systems), transmembrane activator and calcium-modulating cyclophilin ligand interactor (TACI)-Ig fusion protein (1 μg/ml; Alexis Biochemicals), or chicken IgY (1 μg/ml; R&D Systems) were added and the cells were incubated for 48 h at 37°C. Following incubation, cells were immediately run through the Coulter XL (Beckman Coulter) along with a known number of Flow-Count fluorospheres (Beckman Coulter). Total numbers of viable cells and apoptotic cells were determined by calculating the ratio of cells to beads and assessing the number of cells in either live or apoptotic gates as described in Ref.28 . HMDMs or BL cells were lysed in Tri-reagent (Sigma-Aldrich) and RNA was isolated as per the manufacturer’s recommended protocol. Five micrograms of RNA was reverse transcribed using avian myeloblastosis virus-reverse transcriptase (Promega) to generate cDNA and one-twentieth of that was used as template for PCR conducted in an MJ Research thermocycler PTC 200. The PCR primer pair used for human TLR4 was: 5′-TGGGGCGGCACATCTTCTGGAGACGACTCA-3′ and 5′-GGCATCTTGCATCAGGAGCCCCTTGACGAC-3′, which generated a 599-bp product. The PCR primer pair used for BAFF was: 5′-GGAGAAGGCAACTCCAGTCAGAAC-3′ and 5′-CAATTCATCCCCAAAGACATGGAC-3′, which generated a 311-bp product. PCR amplification was performed with TaqDNA polymerase (Invitrogen Life Technologies) for 25 cycles at 94°C for 30 s, 64°C for 1 min, and 72°C for 1 min for TLR4, BAFF, and GAPDH, respectively. All PCR products were run on 1% agarose gels and bands were visualized on a transilluminator following ethidium bromide staining. Control PCR with total RNA preparations that were not subjected to the reverse transcription step showed no genomic DNA contamination in RNA preparations. Statistical significance was tested by one-way ANOVA using the Prism software package (GraphPad Software). We initially confirmed the substantial infiltration of BL tumors by macrophages using standard histology and immunohistochemistry. As shown in Fig. 1⇓, comparable starry sky histological pictures were obtained from human patient-derived BL (Fig. 1⇓Ai) and SCID BL xenograft (Fig. 1⇓Aii) tumors. CD68 staining of human BL samples and F4/80 staining of SCID BL material confirmed significant numbers of host macrophages present throughout the tumors (data not shown and C. A. Ogden, I. Johannessen, and C. D. Gregory, manuscript in preparation) and large numbers of apoptotic cells were visible, mainly phagocytosed by the tumor-infiltrating macrophages (see especially Fig. 1⇓A, iii and v). Immunohistochemical staining for IL-10 (Fig. 1⇓A, iv and v) revealed staining in both the tumor cells themselves and in the macrophages that had engulfed apoptotic cells in situ, the phagocytes often exhibiting stronger labeling (Fig. 1⇓Av). The stronger IL-10 immunostaining of macrophages appeared to be due not only to the presence of concentrated label associated with engulfed apoptotic cells, but also to the production of IL-10 by the macrophages themselves (Fig. 1⇓Av). 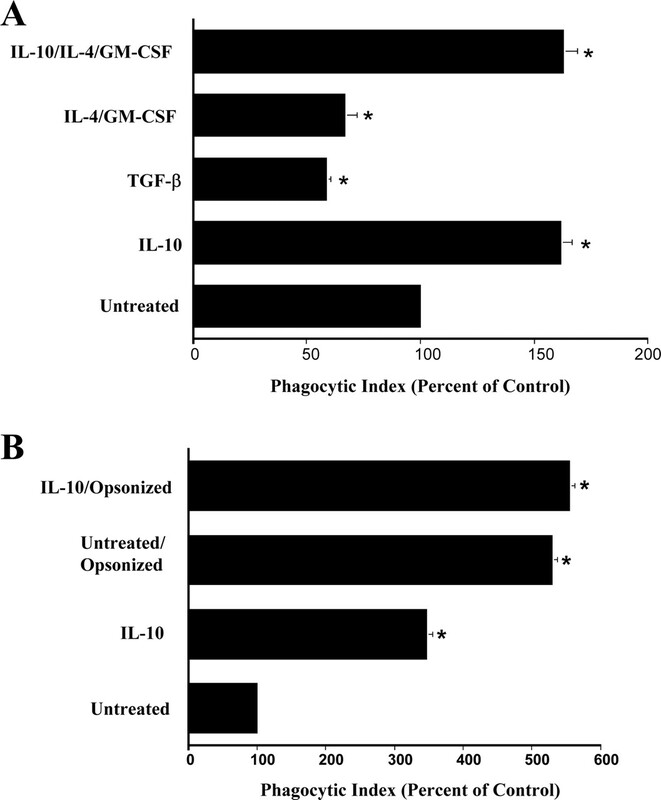 Assessment of IL-10 secretion by BL cells in vitro (Fig. 1⇓B) demonstrated productivity by all lines tested, with EBV-positive lines producing more IL-10 than EBV-negative cells, confirming previous work (29, 30). These results illustrate the high frequency of apoptotic cells and macrophages in BL and indicate that the microenvironment of this tumor can be enriched in IL-10 not only as a consequence of productivity of this cytokine by the tumor cells, but also as a result of its production by macrophages, possibly resulting from apoptotic cell engulfment. Burkitt’s lymphoma: tumor-associated macrophages in an IL-10-rich environment. Ai, Low power micrograph showing classic starry sky pattern of widespread infiltration of tumor by macrophages in a human BL section. ii, SCID mice injected with human BL cells develop tumors with starry sky histology identical to human BL tumor. iii, Micrograph of SCID BL section stained with isotype control; counterstain, methyl green. Note TAMs that have engulfed apoptotic cells (arrows). iv, Micrograph of SCID BL tumor section stained with anti-IL-10 Ab; counterstain, methyl green. BL cells and TAMs stain for IL-10. v, High-power micrograph of BL section stained with anti-IL-10 Ab; counterstain, methyl green. BL cells and TAMs stain for IL-10. Note TAMs that have engulfed apoptotic cells (arrows); some (e.g., ∗) stain particularly strongly for IL-10. Human tumor biopsy illustrated representative of five analyzed. B, Secretion of IL-10 by BL cell lines. Supernatants from EBV-positive (Raji, Mutu) and EBV-negative (BL-2) BL lines were tested for human IL-10 by ELISA. To model possible consequences of an IL-10-rich microenvironment for clearance of apoptotic cells by macrophages, we investigated the effects of IL-10 on HMDMs in vitro. HMDMs are known readily to engulf apoptotic BL cells derived from cell lines that retain the phenotype of the original tumor biopsy (31) as well as fresh tumor biopsy cells, either from human patient samples or from SCID BL xenografts (C. A. Ogden and C. D. Gregory, unpublished data). As shown in Fig. 2⇓A, HMDMs matured for 5 days in the presence of IL-10 were significantly enhanced in their capacity to engulf apoptotic BL cells (quantified as phagocytic index, a combined measure of the proportion of macrophages that phagocytose and the number of apoptotic cells engulfed per macrophage (20, 26)) as compared with untreated HMDMs. Treatment with other cytokines of possible relevance to the BL microenvironment (13), TGF-β1, IL-4, and GM-CSF, caused reduction in the capacity of HMDMs to engulf apoptotic BL cells. Intriguingly, the augmentation of clearance caused by IL-10 was dominant over the inhibition caused by IL-4/GM-CSF (Fig. 2⇓A). Dominant potentiation of apoptotic BL cell clearance, but not opsonized particles, by IL-10. A, Before use in phagocytic assays, HMDMs were cultured for 5 days in the presence or absence of IL-10, TGF-β1, IL-4 plus GM-CSF, or IL-10 plus IL-4 plus GM-CSF. Mutu BL cells were induced into apoptosis by UV irradiation and cocultured for 1 h with HMDMs (BL: HMDM ratio 5:1) that had been matured for 5 days in the presence or absence of IL-10. Excess BL cells were removed by washing and phagocytic indices were recorded by microscopic analysis of Formalin-fixed, hematoxylin-stained samples. Apoptosis of Mutu cells was monitored in all experiments by DAPI staining and averaged 80%. Data shown are means ± SEM (n = 4 separate experiments); ∗, p < 0.05 (treated vs untreated) by one-way ANOVA. B, Neutrophils were induced to undergo apoptosis by culture in serum-free medium overnight (60–70% apoptotic cells were observed in DAPI-stained samples). Apoptotic cells were either added directly to HMDMs that had been matured for 5 days in the presence or absence of IL-10 or were added following IgG opsonization with mouse anti-HLA mAb and rabbit anti-mouse IgG. Phagocytic indices were recorded. To determine whether the observed augmentation of apoptotic BL cell engulfment represented a specific effect on apoptotic cell clearance or a general effect on phagocytosis by HMDMs, macrophages were assessed for their ability to engulf opsonized particles. As shown in Fig. 2⇑B, IL-10-treated HMDMs were markedly increased in their capacity to engulf apoptotic neutrophils, demonstrating that the augmented engulfment of apoptotic cells by IL-10-treated macrophages is not limited to apoptotic BL cells. Furthermore, IgG-opsonized apoptotic neutrophils were engulfed to a similar extent by untreated and IL-10-treated macrophages. Similarly, when untreated or IL-10-treated macrophages were examined for their capacity to phagocytose zymosan particles, again no differences were noted: serum (complement)-opsonized zymosan particles were phagocytosed more efficiently than untreated zymosan, but IL-10 macrophages were comparable to untreated macrophages in their capacity to engulf either untreated or opsonized zymosan (data not shown). These results suggest that the observed effects of IL-10 in enhancing apoptotic cell uptake are not caused by a generalized increase in the capacity of the macrophages to mediate phagocytosis. We have shown previously that CD14 functions as a key macrophage receptor for apoptotic cells, both in vitro (32) and in vivo (33). To determine whether CD14 plays any role in the potentiation of apoptotic cell clearance by IL-10, engulfment assays were subjected to blockade using anti-CD14 mAbs. As shown in Fig. 3⇓, treatment of macrophages with the CD14 blocking mAb 61D3 abolished the IL-10-induced effect (Fig. 3⇓, left panels) while, as we have reported previously (31, 32), the nonblocking CD14 mAb 63D3 failed to affect apoptotic cell clearance by HMDMs (data not shown). To assess whether the augmented CD14-dependent apoptotic cell clearance by macrophages following IL-10 treatment could have been caused by increased CD14 expression, macrophage surface CD14 was monitored by immunostaining and flow cytometry. As shown in Fig. 3⇓, although macrophage surface CD14 can be significantly enhanced by IL-10 in a donor-dependent manner, the enhancement of apoptotic cell clearance was observed in all donors, regardless of CD14 up-regulation. Thus, the HMDMs from the donor illustrated in Fig. 3⇓A clearly up-regulate surface CD14 in response to IL-10 while those from the donor shown in Fig. 3⇓B do not (Fig. 3⇓, right panels). However, CD14-dependent apoptotic cell clearance is significantly enhanced in both cases (Fig. 3⇓, left panels). Indeed, the IL-10-induced promotion of apoptotic cell clearance appeared to be more prominent when surface CD14 expression remained unchanged (cf Fig. 3⇓, lower panels). These results demonstrate that although CD14 is required for the effect of IL-10 on apoptotic cell clearance, the functional activity of CD14 in IL-10-treated macrophages can be uncoupled from increases in the quantity of CD14 expressed at the macrophage surface. IL-10 induces up-regulation of CD14-dependent apoptotic cell clearance by HMDMs independent of surface expression levels. A, Donor 1: Flow cytometric histograms of CD14-immunostained HMDMs showing examples of a donor that up-regulated surface CD14 expression following treatment with IL-10 for 5 days. Phagocytic indices for the same HMDMs fed apoptotic Mutu BL cells were assessed exactly as described in Fig. 2⇑. 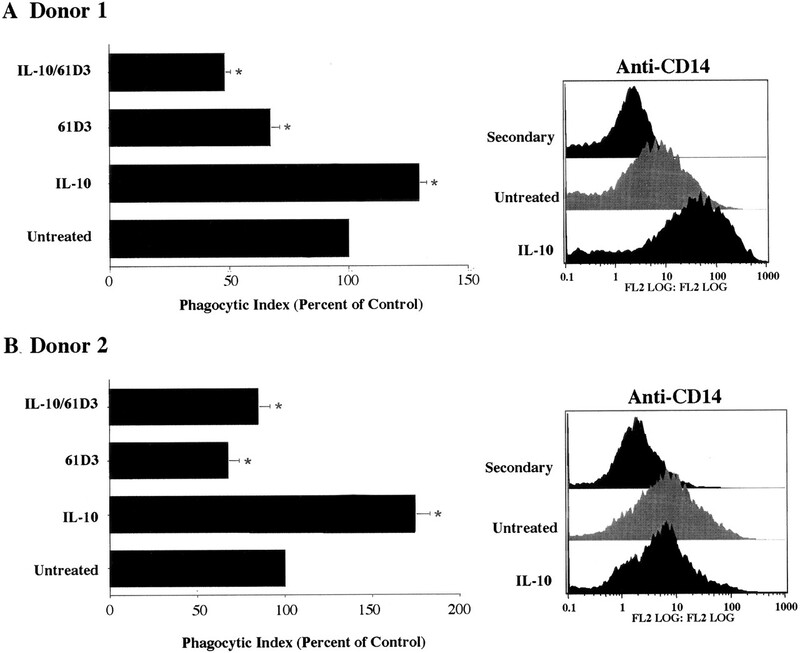 B, Donor 2: CD14 immunostaining demonstrating no increase in CD14 levels in IL-10-matured macrophages; however, phagocytosis assays utilizing macrophages from the same donor exhibit significant up-regulation of clearance capability by the macrophages. Data shown are means ± SEM (n = 4 separate experiments); ∗, p < 0.05 by one-way ANOVA. It is known that CD14 is involved in the proinflammatory responses of macrophages to LPS (34) and that such activity is down-regulated by IL-10 (35). In an attempt to obtain clues as to the mechanisms underlying the differential changes in CD14-dependent functions induced by IL-10 (increased apoptotic cell clearance vs decreased LPS responsiveness), we compared expression levels of TLR4 in untreated and IL-10-treated HMDMs, since TLR4 expression is a prerequisite for responsiveness to most classes of LPS (36). As shown in Fig. 4⇓, we confirm that LPS responsiveness of HMDMs, as measured by TNF-α production, is significantly reduced following IL-10 treatment (Fig. 4⇓A). Our previous results have already demonstrated that HMDMs in this model respond to LPS via CD14 (32). Exposure of HMDMs to IL-10 fails to induce changes in the expression of TLR4, either at the level of mRNA (Fig. 4⇓B) or protein (Fig. 4⇓C). These results demonstrate that the differential activity of CD14 in responses of IL-10-treated macrophages to apoptotic cells and to LPS is not determined at the level of TLR4 expression. A, IL-10-treated HMDMs are inhibited in their capacity to respond to LPS. HMDMs matured for 5 days in the presence or absence of IL-10 were treated with LPS for 18 h as indicated and TNF-α released into the supernatant was determined by ELISA. Data shown are means ± SEM (n = 10 separate experiments); ∗, p < 0.05 (treated vs untreated) by one-way ANOVA. 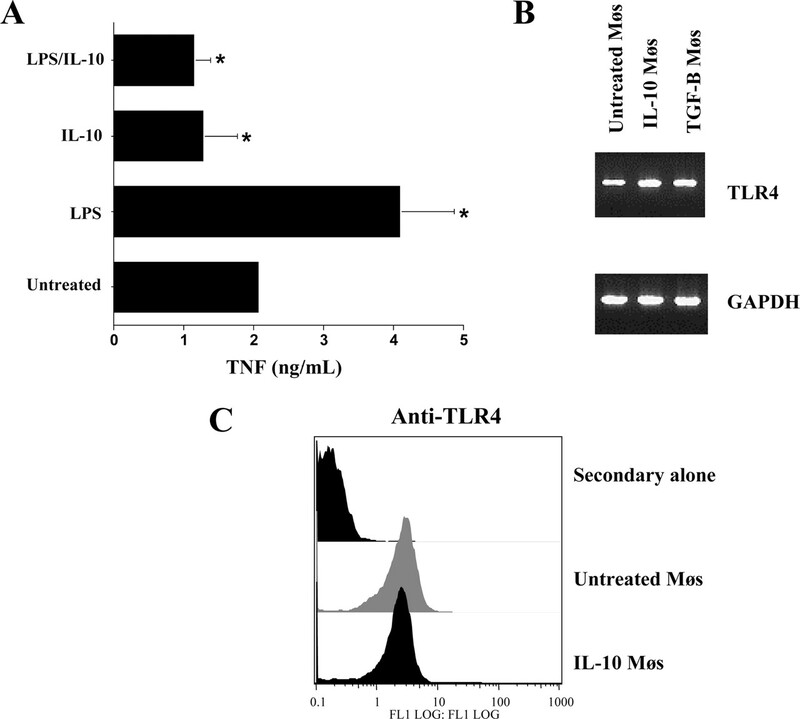 B, IL-10-treated HMDMs fail to down-regulate TLR4. HMDMs were matured in the presence or absence of IL-10 or TGF-β1, after which RT-PCR was conducted to assess expression of TLR-4 RNA. Levels of the housekeeping gene GAPDH are shown for comparison. C, Flow cytometric histograms of anti-TLR4 immunostained HMDMs matured for 5 days in the presence or absence of IL-10. Results shown are representative of three similar experiments. Mφ, Macrophage. We hypothesized that an important function of TAMs in BL is the production of survival factors that limit the level of apoptosis in the tumor population, thus allowing net increase of viable tumor cell numbers. We selected BAFF/BLyS as a candidate factor since it is known to be produced by monocytes and macrophages and to be functional in promoting survival of malignant, as well as normal, B cells (14, 15, 16, 17, 18, 37, 38). Immunohistochemical staining demonstrated strong labeling of BAFF in TAMs in situ both in human patient samples and in SCID BL xenograft tumors (Fig. 5⇓A). Notably, BAFF was present at high levels in macrophages that had engulfed apoptotic cells. The tumor B cells in BL were heterogeneous with respect to BAFF expression. Thus, of a panel of BLs containing both EBV-positive and -negative cases, BAFF expression at the message level was either weakly positive (Ramos, Wan) or negative (Mutu, Chep, BL-2) (Fig. 5⇓B). These observations were confirmed at the protein level by immunoblotting (data not shown). Expression of BAFF by monocytes and macrophages, by contrast, was readily demonstrable (Fig. 5⇓B). In immunohistochemical analyses, BAFF staining could be found in association not only with the TAMs but also with the tumor cells themselves (Fig. 5⇓A). However, as illustrated by Mutu I SCID BL (Fig. 5⇓Aii) in which the tumor B cells clearly fail to produce BAFF (Fig. 5⇓B, Tumor Mutu), weak BAFF labeling of the tumor cells, probably at the surface, most likely originated from neighboring TAMs. A, Tumor-associated macrophages produce the B cell proliferation factor BAFF. i, High-power micrograph of human BL section with macrophages and tumor cells that stain positive for the presence of BAFF. Counterstain, hematoxylin. ii, High-power micrograph of SCID BL tumor with host macrophages staining positive for BAFF. Counterstain, methyl green. B, Heterogeneous production of BAFF mRNA by BL lines (Ramos, BL-2, Chep, Wan) and fresh SCID BL cells (Tumor Mutu). Human monocytes used as positive control for BAFF mRNA detection by RT-PCR. 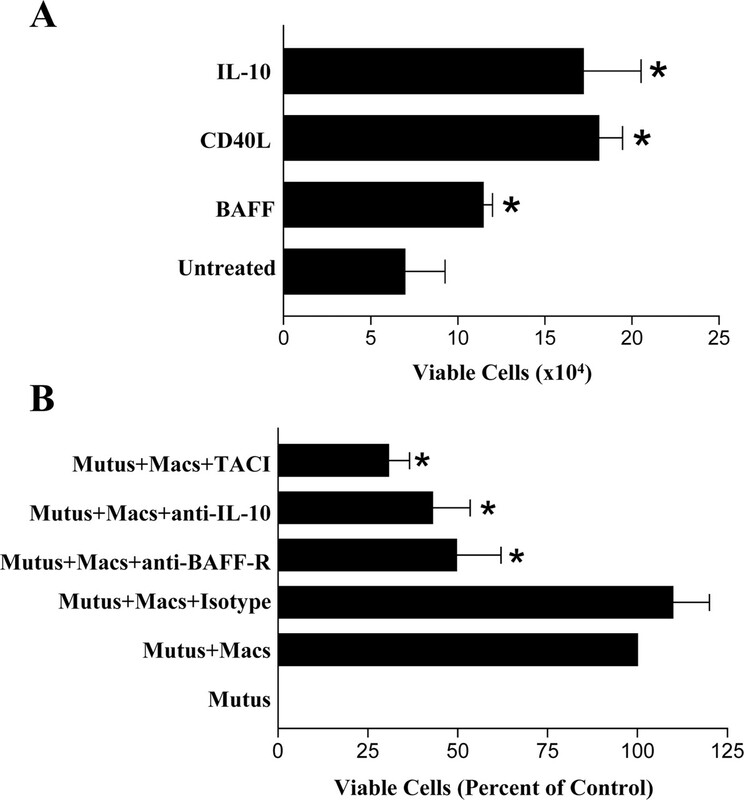 C, Macrophages (Macs) produce increased levels of BAFF when cocultured with IL-10 and BL cells. Macrophages matured in the presence or absence of IL-10 were cocultured with viable Mutus for 18 h. Supernatants were analyzed for BAFF by ELISA. Data shown are means ± SEM (n = 3 separate experiments); ∗, p < 0.001 by one-way ANOVA. D, Neutralizing anti-IL-10 inhibits production of BAFF by human monocyte-derived macrophages. HMDMs were cultured alone, in the presence of isotype control Ab, or in the presence of neutralizing anti-IL-10 Ab for 48 h. Supernatants were then analyzed for BAFF production by ELISA. Data shown are means ± SEM (n = 8 separate experiments); ∗, p < 0.001 by one-way ANOVA. Production of soluble BAFF by macrophages but not Mutu I cells was detectable by ELISA (Fig. 5⇑, C and D) in amounts that were in line with those reported for serum BAFF levels (39) and was significantly increased by IL-10 treatment (Fig. 5⇑C). Cocultures of Mutu I BL cells and HMDMs produced more BAFF than macrophages alone and maximal levels of BAFF were observed from cocultures of IL-10-treated macrophages and Mutu I cells (Fig. 5⇑C). Treatment of macrophages with neutralizing anti-IL-10 Ab markedly inhibited the capacity of the macrophages to produce BAFF (Fig. 5⇑D), further illustrating that macrophage production of BAFF is regulated by IL-10. These results indicate that TAMs in BL produce BAFF and this can be recapitulated by HMDMs in vitro with IL-10 treatment of macrophages leading to enhanced BAFF production. 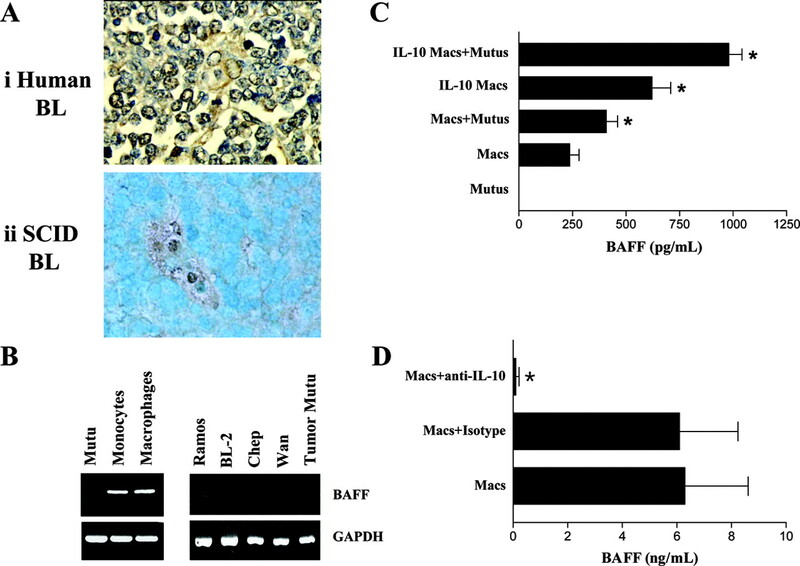 Further enhanced levels of BAFF are produced by cocultures of BL cells and IL-10-activated macrophages that model elements of the tumor microenvironment. To determine whether BAFF can enhance BL cell survival, recombinant human BAFF was added to BL cultures in the absence of serum (which contains significant amounts of BAFF). As shown in Fig. 6⇓A, BAFF significantly promoted BL cell survival although less potently than either IL-10 or CD40L. Since numbers of viable cells were also found to increase over this period in the presence of BAFF (as well as with IL-10 and CD40L), these results may indicate that both BL proliferation and survival were enhanced by BAFF. Importantly, coculture of BL cells with macrophages under serum-free conditions which, in the absence of macrophages resulted in total BL cell death (in line with the known propensity of group I BL to undergo substantial apoptosis under conditions of limiting serum-derived survival factors (2)), substantially promoted BL cell survival and this was reduced by >50% by an antagonistic anti-BAFF receptor Ab and by a soluble decoy receptor for BAFF, TACI-Ig (Fig. 6⇓B). Inclusion of an anti-IL-10-neutralizing Ab in these cocultures produced similar levels of inhibition of BL cell survival. These results show that macrophages can markedly promote BL cell survival through a BAFF-dependent mechanism. BAFF stimulates survival and proliferation of BL cells. A, Mutu BL cells were washed and resuspended in serum-free RPMI 1640 medium. CD40L, BAFF, or IL-10 were added where indicated, and total numbers of viable cells were assessed after 24 h by flow cytometry. Data shown are means ± SEM (n = 3 separate experiments); ∗, p < 0.05 by one-way ANOVA. B, BAFF-stimulated proliferation can be neutralized with anti-BAFF receptor Ab, anti-IL-10-neutralizing Ab, and a soluble BAFF decoy receptor fusion protein TACI-Ig. BL cells were coincubated with IL-10-matured HMDMs for 48 h in serum-free RPMI 1640 medium with or without isotype control, anti-BAFF-R, anti-IL-10, or TACI-Ig. Data shown are means ± SEM (n = 3 separate experiments); ∗, p < 0.01 by one-way ANOVA. Macs, Macrophages. Although little is yet known of the interrelationships between the TAMs and tumor cells in BL, one clear function of TAMs that is apparent from the histological picture of the tumor is the engulfment of cells that undergo apoptosis in situ. This function of TAMs is not limited to BL but also occurs in other lymphomas that display high levels of apoptosis and macrophage infiltration (e.g., immunoblastic lymphoma, pre-B and pre-T lymphoblastic lymphoma (40)). Since the engulfment of apoptotic cells by macrophages is now well recognized as an immunomodulatory process that is usually suppressive in nature (reviewed in Ref.5), we hypothesize that a novel function of TAMs may be to promote tumor development by suppressing, via apoptotic cell clearance mechanisms, antitumor immunity. We also hypothesize, given the inherent propensity of BL cells to undergo apoptosis, that TAMs provide factors that promote net tumor growth by limiting the level of apoptosis in situ and/or by promoting the tumor cell proliferation rate. In this study, we focus on the pleiotropic cytokine, IL-10, whose role in lymphomagenesis is not fully understood. We report that IL-10 significantly enhances apoptotic cell clearance by macrophages and supports BL cell survival. This cytokine was originally thought to be an inhibitor of macrophage activation but is now renowned for its capacity to generate a polarized, “M2” or “alternatively activated” macrophage phenotype (9, 11). IL-10 acts as an autocrine growth factor for normal, EBV-immortalized, and malignant B cells, including BL cells (29, 41, 42, 43). The vast majority of cases of BL produce IL-10 and, although EBV-positive cases of the tumor secrete higher levels of the cytokine as a result of EBV-driven productivity, IL-10 production by BL cells is not dependent on the presence of EBV (29, 30, 44). At face value, the fact that IL-10-negative cases of BL arise (albeit in a minority) may argue against a role for IL-10 in tumor generation or progression through its effects on TAMs. However, TAMs in BL examined in situ that had engulfed apoptotic cells also expressed IL-10 (Fig. 1⇑). This suggests that macrophage-derived IL-10 could be produced as a consequence of apoptotic cell clearance and could act not only as a growth factor for the tumor cells but also as an autocrine stimulator of both clearance and survival factor production by macrophages. Although monocytes are capable of producing IL-10 in response to apoptotic cells (45), HMDMs that phagocytose apoptotic cells did not appear to produce IL-10 (27). The results obtained thus far, however, indicate that TAMs may be capable of producing IL-10 in response to apoptotic cells. Since IL-10 production by TAMs represents an autocrine mechanism by which IL-12 production and NF-κB activation are inhibited in these cells (46), apoptotic cell clearance with consequent IL-10 production could have important implications for inhibition of antitumor immune responses, particularly in the case of IL-10-negative tumors. Using HMDMs in vitro, we demonstrate for the first time that IL-10 treatment of macrophages enhances their capacity to engulf apoptotic cells. At the same time macrophage responsiveness to LPS, known to be dependent on CD14 under these conditions (32), is predictably inhibited by IL-10. Significantly, the enhanced clearance of apoptotic cells that is a feature of the IL-10-treated macrophages was found to be dependent on CD14 and was sometimes (though this was not a prerequisite) associated with up-regulated CD14 on the macrophage surface. IL-10 has been shown previously to up-regulate CD14 on the surface of synovial macrophages, although the functional attributes of the increased levels of the receptor were not investigated (47). The observed CD14 dependence of the up-regulated apoptotic cell clearance by IL-10 may lie in the requirement for CD14 in tethering apoptotic BL cells to macrophages (33). Following the initial tethering phase, additional IL-10-driven, CD14-independent mechanisms leading to enhanced phagocytosis may be activated. Detailed investigations of the mechanisms underlying the differential responses to CD14 ligands (i.e., LPS or apoptotic cell-associated structures) generated in IL-10-treated macrophages are beyond the scope of this article. Thus, a substantial body of research has been undertaken to determine IL-10R signaling mechanisms which are not fully understood, particularly downstream of STAT3 activation (35, 48, 49, 50). We hypothesized that CD14, a glycosyl phosphatidylinositol-linked receptor, might cooperate with different signal-transducing molecules in untreated and IL-10-treated macrophages. The most obvious candidate cooperating receptor is TLR4, which is required for LPS responsiveness (36) but not for the phagocytosis of apoptotic cells (51, 52, 53). However, expression of TLR4 remained unchanged in 5-day, IL-10-treated HMDMs. Qualitative changes in TLR4 and/or CD14 may occur during IL-10 treatment of macrophages that result in uncoupling of proinflammatory signaling pathways from these molecules (as has been reported, for example, in LPS tolerance (54)) and/or coupling of anti-inflammatory signaling mechanisms. Recent work has suggested that down-regulation of proinflammatory responses in IL-10-treated monocytes and TAMs in BL could be mediated by glucocorticoid-induced leucine zipper that is up-regulated and interferes with NF-κB activation in the phagocytes (55). Our preliminary studies, however, indicate that glucocorticoid-induced leucine zipper expression is equivalent in 5-day HMDMs with or without IL-10 (data not shown). Further work will be required to determine the mechanism of improved (CD14-dependent) apoptotic cell clearance by macrophages exposed to IL-10. The enhanced clearance of apoptotic BL cells by IL-10-treated HMDMs appeared not to be due to general promotional effects on phagocytosis by HMDMs since both opsonized apoptotic cells and zymosan particles were phagocytosed comparably by IL-10-treated and untreated macrophages. These results differ from previous reports suggesting that phagocytosis could be increased upon exposure of macrophages to IL-10 (56, 57). The apparent discordance between these earlier results and the present studies is most likely due to differences in experimental protocols. In the present work, macrophages were studied after 5 days of continuous culture with IL-10 when maximal potentiation of apoptotic cell clearance was observed (data not shown). Our results are consistent with the conclusion that the effects of IL-10 on phagocytosis by 5-day HMDMs, at least those cultured continuously with the cytokine, are specific to apoptotic cells as the target particle. We are currently investigating whether TAMs isolated from IL-10-positive lymphoma microenvironments themselves exhibit similarly enhanced phagocytic selectivity. In BL, apoptosis occurs constitutively and yet there is net tumor growth. Therefore, the rate of survival of tumor cells in BL must outweigh their rate of apoptosis. We found that macrophages matured in the presence of IL-10 not only show up-regulated capacity to recognize and engulf apoptotic cells, but also produce significantly increased quantities of the B cell survival factor BAFF/BLyS. We also found that BAFF production or secretion by macrophages can be regulated by IL-10. These results confirm and extend those reported previously (58) suggesting a mechanism that may play a role in the negative control of BL cell apoptosis in situ that permits net tumor growth. In addition we showed for the first time that TAMs themselves express BAFF in situ in BL and that coculture of BAFF-negative BL cells with macrophages leads to enhancement of BAFF production in vitro. Furthermore, by targeting the specific receptor for BAFF, BAFF-R (59), we demonstrated that BAFF plays an important role in promoting survival of BL cells in such cocultures. In addition, a soluble decoy receptor, TACI-Ig fusion protein (which would compete for both BAFF and a proliferation-inducing ligand (APRIL) binding sites on BL cells since it functions as both a BAFF and APRIL receptor (60)) also inhibits macrophage-dependent BL B cell survival. These findings extend recent results in other systems suggesting that BAFF/BLyS and also its close relative, APRIL may contribute to pathogenesis of B cell malignancies (16, 17, 18, 38). The relative importance of BAFF-mediated tumor cell survival in the oncogenic process awaits clarification, e.g., using tumor models in BAFF-deficient animals. Residual macrophage-mediated survival of BL cells following blockade of BAFF/APRIL or IL-10 (Fig. 6⇑) suggest additional pathways. Thus, complicating issues remain. Apart from the conceivable functional redundancy of BAFF and APRIL in tumorigenesis, there are likely to be multiple mechanisms through which BAFF contributes to the oncogenic process. Thus, although previous work has largely focused on autocrine BAFF activity, our results favor a paracrine mechanism which may prove to be especially important for tumors in which the malignant cells themselves fail to produce BAFF. Production of BAFF by the tumor cells in cases of BL is heterogeneous with some producing BAFF themselves (such as Ramos and Wan (Fig. 5⇑); see also Ref.18) and others (such as Mutu-BL, Chep, and BL-2 used here and lines reported elsewhere (18)) not. The present results are consistent with the notion that BAFF production by TAMs may play a key role in limiting tumor cell apoptosis in BL. In conclusion, the present studies demonstrate using HMDMs in vitro that an IL-10-rich microenvironment, such as the environment experienced by TAMs in BL, is very likely to be able not only to potentiate the clearance of apoptotic cells but also to promote tumor cell survival factor production by macrophages in situ. Although detailed experiments will be required comparing isolated TAMs with macrophages from other sites, along with analyses of the requirements for TAMs in BL pathogenesis, the results obtained to date are consistent with the hypothesis that macrophages could play an important role in tumorigenesis through 1) efficient apoptotic cell clearance mechanisms that ensure continuity of anti-inflammatory signals during the evolution and progression of the tumor and 2) provision of paracrine survival factors that limit apoptosis levels in the tumor cell population. Macrophages that interact with apoptotic cells fail to elicit adaptive immune responses against apoptotic cell-derived Ags (61, 62), consistent with the notion that effective apoptotic cell clearance by TAMs could have important immunosuppressive or tolerizing consequences for adaptive antitumor immunity. TAMs have been held as paradigms of so-called alternatively activated or M2 macrophages, IL-10 being an alternative activator of macrophages par excellence (9). The present studies demonstrate that such alternative activation in vitro produces a macrophage phenotype that is exquisitely efficient in apoptotic cell clearance and enhanced in survival factor production. It will now be important to investigate in vivo whether apoptosis, TAMs, and clearance of apoptotic cells play significant roles in the development, maintenance, or progression of lymphoma. We are grateful to Sarah Watson for technical assistance in the generation of SCID BL tumors. ↵1 This work was supported by the Leukaemia Research Fund and the Medical Research Council (U.K.). ↵3 Abbreviations used in this paper: BL, Burkitt’s lymphoma; BAFF, B cell-activating factor of the TNF family; BLyS, B lymphocyte stimulator; DAPI, 4′,6′-diamidino-2-phenylindole; HMDM, human monocyte-derived macrophage; TACI, transmembrane activator and CAML interactor; TAM, tumor-associated macrophage; PMN, polymorphonuclear neutrophil; APRIL, a proliferation-inducing ligand. Berard, C., G. T. O’Conor, L. B. Thomas, H. Torloni. 1969. Histopathological definition of Burkitt’s tumour. Bull. W. H. O. 40:601. Gregory, C. D., C. Dive, S. Henderson, C. A. Smith, G. T. Williams, J. Gordon, A. B. Rickinson. 1991. Activation of Epstein-Barr virus latent genes protects human B cells from death by apoptosis. Nature 349:612. Milner, A. E., R. J. A. Grand, C. M. Waters, C. D. Gregory. 1993. Apoptosis in Burkitt lymphoma cells is driven by c-myc. Oncogene 8:3385. Savill, J., I. Dransfield, C. D. Gregory, C. Haslett. 2002. A blast from the past: clearance of apoptotic cells regulates immune responses. Nat. Rev. Immunol. 2:965. Gregory, C. D., A. Devitt. 2004. The macrophage and the apoptotic cell: an innate immune interaction viewed simplistically?. Immunology 113:1. Mantovani, A., B. Bottazzi, F. Colotta, S. Sozzani, L. Ruco. 1992. The origin and function of tumor-associated macrophages. Immunol. Today 13:265. Mantovani, A.. 1994. Tumor-associated macrophages in neoplastic progression: a paradigm for the in-vivo function of chemokines. Lab. Invest. 71:5. Mantovani, A., S. Sozzani, M. Locati, P. Allavena, A. Sica. 2002. Macrophage polarization: tumor-associated macrophages as a paradigm for polarized M2 mononuclear phagocytes. Trends Immunol. 23:549. Balkwill, F., A. Mantovani. 2001. Inflammation and cancer: back to Virchow?. Lancet 357:539. Gordon, S.. 2003. Alternative activation of macrophages. Nat. Rev. Immunol. 3:23. Harrington, E. A., M. R. Bennett, A. Fanidi, G. I. Evan. 1994. c-myc-induced apoptosis in fibroblasts is inhibited by specific cytokines. EMBO J. 13:3286. Levens, J. M., J. Gordon, C. D. Gregory. 2000. Micro-environmental factors in the survival of human B-lymphoma cells. Cell Death Differ. 7:59. Moore, P. A., O. Belvedere, A. Orr, K. Pieri, D. W. LaFleur, P. Feng, D. Soppet, M. Charters, R. Gentz, D. Parmelee, et al 1999. BLyS: member of the tumor necrosis factor family and B lymphocyte stimulator. Science 285:260. Novak, A. J., R. J. Bram, N. E. Kay, D. F. Jelinek. 2002. Aberrant expression of B-lymphocyte stimulator by B chronic lymphocytic leukemia cells: a mechanism for survival. Blood 100:2973. Novak, A. J., J. R. Darce, B. K. Arendt, B. Harder, K. Henderson, W. Kindsvogel, J. A. Gross, P. R. Greipp, D. F. Jelinek. 2004. Expression of BCMA, TACI, and BAFF-R in multiple myeloma: a mechanism for growth and survival. Blood 103:689. He, B., A. Chadburn, E. Jou, E. J. Schattner, D. M. Knowles, A. Cerutti. 2004. Lymphoma B cells evade apoptosis through the TNF family members BAFF/BLyS and APRIL. J. Immunol. 172:3268. Haslett, C., L. A. Guthrie, M. M. Kopaniak, R. B. Johnston, P. M. Henson. 1985. Modulation of multiple neutrophil functions by preparative methods or trace concentrations of bacterial lipopolysaccharide. Am. J. Pathol. 119:101. Ogden, C. A., A. deCathelineau, P. R. Hoffmann, D. Bratton, B. Ghebrehiwet, V. A. Fadok, P. M. Henson. 2001. C1q and mannose binding lectin engagement of cell surface calreticulin and CD91 initiates macropinocytosis and uptake of apoptotic cells. J. Exp. Med. 194:781. Gregory, C. D., M. Rowe, A. B. Rickinson. 1990. Different Epstein-Barr virus-B cell interactions in phenotypically distinct clones of a Burkitt’s lymphoma cell line. J. Gen. Virol. 71:1481. Rooney, C. M., C. D. Gregory, M. Rowe, S. Finerty, C. Edwards, H. Rupani, A. B. Rickinson. 1986. Endemic Burkitt’s lymphoma - phenotypic analysis of tumor biopsy cells and of derived tumor cell lines. J. Natl. Cancer Inst. 77:681. Pulvertaft, R. J. V.. 1964. Cytology of Burkitt’s tumour (African lymphoma). Lancet 1:238. Lenoir, G. M., M. Vuillaume, C. Bonnardel. 1985. The use of lymphomatous and lymphoblastoid cell lines in the study of Burkitt’s lymphoma. G. Lenoir, and G. O’Connor, and C. L. M. Olweny, eds. Burkitt’s Lymphoma, a Human Cancer Model, International Agency for Research on Cancer Publication 60 309. International Agency for Research on Cancer, Lyon. Devitt, A., S. Pierce, C. Oldreive, W. H. Shingler, C. D. Gregory. 2003. CD14-dependent clearance of apoptotic cells by human macrophages: the role of phosphatidylserine. Cell Death Differ. 10:371. Fadok, V. A., M. L. Warner, D. L. Bratton, P. M. Henson. 1998. CD36 is required for phagocytosis of apoptotic cells by human macrophages that use either a phosphatidylserine receptor or the vitronectin receptor (αvβ3). J. Immunol. 161:6250. Milner, A. E., J. M. Levens, C. D. Gregory. 1998. Flow cytometric methods of analyzing apoptotic cells. Methods Mol. Biol. 80:347. Burdin, N., C. Peronne, J. Banchereau, F. Rousset. 1993. Epstein-Barr-virus transformation induces lymphocytes-B to produce human interleukin-10. J. Exp. Med. 177:295. Nakagomi, H., R. Dolcetti, M. T. Bejarano, P. Pisa, R. Kiessling, M. G. Masucci. 1994. The Epstein-Barr virus latent membrane protein-1 (LMP1) induces interleukin-10 production in Burkitt lymphoma lines. Int. J. Cancer 57:240. Flora, P. K., C. D. Gregory. 1994. Recognition of apoptotic cells by human macrophages: inhibition by a monocyte/macrophage-specific monoclonal antibody. Eur. J. Immunol. 24:2625. Devitt, A., O. D. Moffatt, C. Raykundalia, J. D. Capra, D. L. Simmons, C. D. Gregory. 1998. Human CD14 mediates recognition and phagocytosis of apoptotic cells. Nature 392:505. Devitt, A., K. Parker, C. A. Ogden, C. Oldreive, M. C. Clay, L. Hay, C. O. Bellamy, A. Lacey-Hulbert, S. C. Gangloff, S. Goyert, and C. D. Gregory. 2004. Persistence of apoptotic cells without autoimmune disease or inflammation in CD14−/− mice. J. Cell Biol. In press. Ulevitch, R. J., P. S. Tobias. 1995. Receptor-dependent mechanisms of cell stimulation by bacterial endotoxin. Annu. Rev. Immunol. 13:437. Moore, K. W., R. D. Malefyt, R. L. Coffman, A. O’Garra. 2001. Interleukin-10 and the interleukin-10 receptor. Annu. Rev. Immunol. 19:683. Avery, D. T., S. L. Kalled, J. I. Ellyard, C. Ambrose, S. A. Bixler, M. Thien, R. Brink, F. Mackay, P. D. Hodgkin, S. G. Tangye. 2003. BAFF selectively enhances the survival of plasmablasts generated from human memory B cells. J. Clin. Invest. 112:286. Kern, C., J. F. Cornuel, C. Billard, R. Tang, D. Rouillard, V. Stenou, T. Defrance, F. Ajchenbaum-Cymbalista, P. Y. Simonin, S. Feldblum, J. P. Kolb. 2004. Involvement of BAFF and APRIL in the resistance to apoptosis of B-CLL through an autocrine pathway. Blood 103:679. Mariette, X., S. Roux, J. Zhang, D. Bengoufa, F. Lavie, T. Zhou, R. Kimberly. 2003. The level of BLyS (BAFF) correlates with the titre of autoantibodies in human Sjogren’s syndrome. Ann. Rheum. Dis. 62:168. Hori, M., S. Xiang, C. F. Qi, S. K. Chattopadhyay, T. N. Fredrickson, J. W. Hartley, A. L. Kovalchuk, G. W. Bornkamm, S. Janz, N. G. Copeland, et al 2001. Non-Hodgkin lymphomas of mice. Blood Cells Mol. Dis. 27:217. Masood, R., Y. Zhang, M. W. Bond, D. T. Scadden, T. Moudgil, R. E. Law, M. H. Kaplan, B. Jung, B. M. Espina, Y. Lunardiiskandar, et al 1995. Interleukin-10 is an autocrine growth-factor for acquired immunodeficiency syndrome-related B-cell lymphoma. Blood 85:3423. Beatty, P. R., S. M. Krams, O. M. Martinez. 1997. Involvement of IL-10 in the autonomous growth of EBV- transformed B cell lines. J. Immunol. 158:4045. Kitagawa, N., M. Goto, K. Kurozumi, S. Maruo, M. Fukayama, T. Naoe, M. Yasukawa, K. Hino, T. Suzuki, S. Todo, K. Takada. 2000. Epstein-Barr virus-encoded poly(A)- RNA supports Burkitt’s lymphoma growth through interleukin-10 induction. EMBO J. 19:6742. Stewart, J. P., F. G. Behm, J. R. Arrand, C. M. Rooney. 1994. Differential expression of viral and human interleukin-10 (IL- 10) by primary B-cell tumors and B-cell lines. Virology 200:724. Sica, A., A. Saccani, B. Bottazzi, N. Polentarutti, A. Vecchi, J. Van Damme, A. Mantovani. 2000. Autocrine production of IL-10 mediates defective IL-12 production and NF-κB activation in tumor-associated macrophages. J. Immunol. 164:762. Mottonen, M., P. Isomaki, R. Saario, P. Toivanen, J. Punnonen, O. Lassila. 1998. Interleukin-10 inhibits the capacity of synovial macrophages to function as antigen-presenting cells. Br. J. Rheumatol. 37:1207. Donnelly, R. P., H. Dickensheets, D. S. Finbloom. 1999. The interleukin-10 signal transduction pathway and regulation of gene expression in mononuclear phagocytes. J. Interferon Cytokine Res. 19:563. Williams, L., G. Jarai, A. Smith, P. Finan. 2002. IL-10 expression profiling in human monocytes. J. Leukocyte Biol. 72:800. Lang, R., D. Patel, J. J. Morris, R. L. Rutschman, P. J. Murray. 2002. Shaping gene expression in activated and resting primary macrophages by IL-10. J. Immunol. 169:2253. Fadok, V. A., J. S. Savill, C. Haslett, D. L. Bratton, D. E. Doherty, P. A. Campbell, P. M. Henson. 1992. Different populations of macrophages use either the vitronectin receptor or the phosphatidylserine receptor to recognize and remove apoptotic cells. J. Immunol. 149:4029. Shiratsuchi, A., I. Watanabe, O. Takeuchi, S. Akira, Y. Nakanishi. 2004. Inhibitory effect of Toll-like receptor 4 on fusion between phagosomes and endosomes/lysosomes in macrophages. J. Immunol. 172:2039. Blander, J. M., R. Medzhitov. 2004. Regulation of phagosome maturation by signals from Toll-like receptors. Science 304:1014. Berrebi, D., S. Bruscoli, N. Cohen, A. Foussat, G. Migliorati, L. Bouchet-Delbos, M. C. Maillot, A. Portier, J. Couderc, P. Galanaud, et al 2003. Synthesis of glucocorticoid-induced leucine zipper (GILZ) by macrophages: an anti-inflammatory and immunosuppressive mechanism shared by glucocorticoids and IL-10. Blood 101:729. Spittler, A., C. Schiller, M. Willheim, C. Tempfer, S. Winkler, G. Boltznitulescu. 1995. IL-10 augments CD23 expression on U937 cells and down-regulates IL-4-driven CD23 expression on cultured human blood monocytes: effects of IL-10 and other cytokines on cell phenotype and phagocytosis. Immunology 85:311. Capsoni, F., F. Minonzio, A. M. Ongari, V. Carbonelli, A. Galli, C. Zanussi. 1995. IL-10 up-regulates human monocyte phagocytosis in the presence of IL-4 and IFN-γ. J. Leukocyte Biol. 58:351. Nardelli, B., O. Belvedere, V. Roschke, P. A. Moore, H. S. Olsen, T. S. Migone, S. Sosnovtseva, J. A. Carrell, P. Feng, J. G. Giri, D. M. Hilbert. 2001. Synthesis and release of B-lymphocyte stimulator from myeloid cells. Blood 97:198. Thompson, J. S., S. A. Bixler, F. Qian, K. Vora, M. L. Scott, T. G. Cachero, C. Hession, P. Schneider, I. D. Sizing, C. Mullen, et al 2001. BAFF-R, a newly identified TNF receptor that specifically interacts with BAFF. Science 293:2108. Yu, G., T. Boone, J. Delaney, N. Hawkins, M. Kelley, M. Ramakrishnan, S. McCabe, W. R. Qiu, M. Kornuc, X. Z. Xia, et al 2000. APRIL and TALL-I and receptors BCMA and TACI: system for regulating humoral immunity. Nat. Immunol. 1:252. Albert, M. L., S. F. A. Pearce, L. M. Francisco, B. Sauter, P. Roy, R. L. Silverstein, N. Bhardwaj. 1998. Immature dendritic cells phagocytose apoptotic cells via αvβ5 and CD36, and cross-present antigens to cytotoxic T lymphocytes. J. Exp. Med. 188:1359.